The Great British Food is a magazine for those with a love of British food. 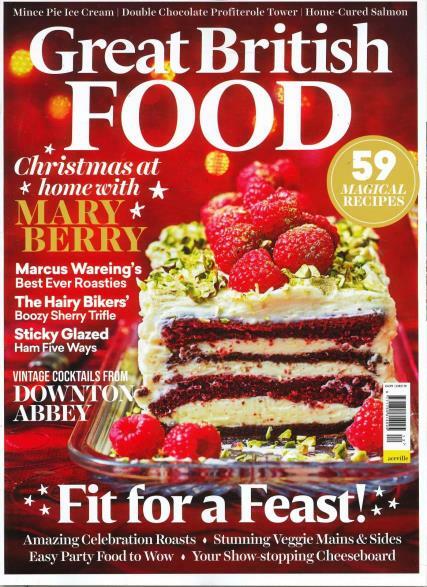 Buy a single copy or subscription to Great British Food magazine. With an emphasis on the pride for consuming the ingredients drawn from home grown produce of UK, the magazine inspires to kindle the culinary instincts of their subscribers to attempt at preparing a host of mouth watering recipes compiled by them. It succeeds to a large extent in virtually coercing and cajoling their clientele to get thinking on their food shopping routines, and to try out drinks and dishes which they would have never tried before. Details of delicacies becoming a rage with the masses at restaurants and patisseries are strategically headlined, supplemented with interviews with top chefs, alongside regular informative and interesting features to sustain reader patronage. A minimum of about fifty recipes including cakes, seasonal seafood delicacies, supper sausages, craft ale, sloe gin etc are covered in every issue of the magazine, complemented by “how to” guides.